Gaining defender status for this season, Jimmy Bartel may be getting on in age, but he is always a Fantasy option. For anyone who played Fantasy last year, I don’t need to remind you the trouble we had with our defenders at the start of the season. Picking reliable defensive options is something we often overlook, and Bartel is exactly that. 2015 was the first year since 2005 (!) that Jimmy failed to average over 95. That’s an incredible stat in itself. Now consider that he had a sub affected score of 8. Taking away that sub score (For future reference I won’t include it in the following stats) Bartel averaged 97.3 last season. The man is a freak. There’s a good reason that Bartel has never (really) averaged under 95, and that’s because he rarely plays a bad game. He has only had 6 scores under 70 in the past 3 home and away seasons (52 games), and only 1 under 60!!! In that same 52 game period, he has managed 21 tons. Not bad for a defender. Jimmy plays a Fantasy friendly game. Last season he averaged 7 marks per game. In fact he has averaged over 5 marks per game in every season since 2003. Some of you may not have even been born then! He will rack up those +6’s all day, and that’s not all. He has averaged over 20 disposals and 4 tackles per game for the last 10 years. He knows how to score! Jimmy may not be able to replicate those days of averaging 100+, but he will almost guarantee you a solid score every week. We have too many headaches to worry about in Fantasy, and to put it simply, we need more Bartel’s to pick from. When you get the chance to select him in defence, you just do it! He will comfortably average 95. The only real argument you can make to not pick Bartel is age, and it doesn’t really hold up. Just look at Boyd last season. Aged 32, he pumped out a huge average of 104. Sure Jimmy may get a rest or two, but you should have sufficient cover to not bother about that. Bartel has always been known for his supreme durability, missing just 14 H&A games in the TEN years prior to last season. That being said, last season still happened. He isn’t a spring chicken anymore, so his body won’t be as immune to injury has he used to be. Playing just 11 games last season is a big concern, so you’ll have to track his fitness in pre-season. Thankfully, Jimmy played the last 9 games of 2015 and looked to be over his early season troubles. For those of you that may be worried about his potential role, I’m not sure it will be much of an issue. Regardless of the new influx of midfielders at the Cattery, Jimmy had found a new role a few years ago. Floating across half back and often pushing forward, he still knows how to find the pill. The Cats love to get the ball in Bartel’s hands and I don’t think that will change. KING – Not only are you getting one of the most consistent premiums to ever grace our Fantasy squads, we are getting him as a DPP in defence at a discount thanks to that sub score. Sure he isn’t getting younger and won’t play 22 games, but you can’t say no to a bloke likely to average 95 at the back! He’s a lock in my side and not going anywhere. What does Bartel average in 2016? FOLLOW ME ON TWITTER: @mattcraigDT for all thing AFL Fantasy (and more). Got something to say about the deck? 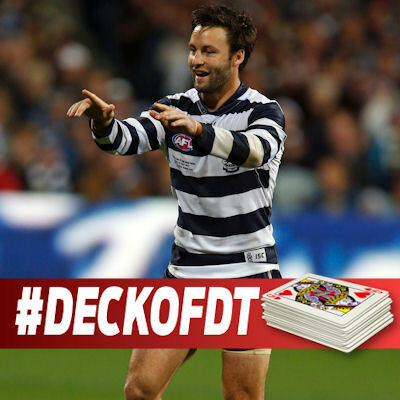 Use the hashtag… #DeckofDT. Perhaps more of a concern in RDT, surely not a worry in Fantasy!